Three black bananas in the fruit bowl need I say more. 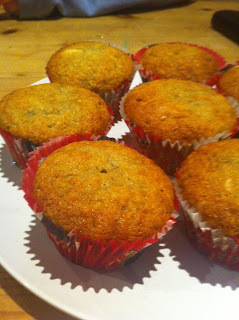 This was a new recipe for me as my bananas loaf recipe makes very heavy muffins. These were extremely light and very delicious. Preheat the oven to 180C or roasting oven with a cold shelf. This makes 12. Combine mashed bananas, sugar, egg and melted butter in a large bowl. Sift together the flour, baking powder, bicarbonate of soda and salt. Fold in flour mixture, and mix until smooth. Bake for 25-30 minutes until golden.